Everything about this project hinted at disaster. The colors I picked (Hint: what rhymes with orange? Nothing.). When I tried to carry the yarn across the back for the color work, the piece was so thick it felt felted; when I switched to intarsia, the piece was as lumpy as mashed potatoes. And the pattern – was it a Kaffe Fasset inspired masterpiece, or something Liberace would wear if he was playing some lumberjack songs? Such a fine line. The cause of the first Hindenburg explosion is a mystery, a mystery as profound as why I spent a full month on this sucker before I realized how bad it looked. 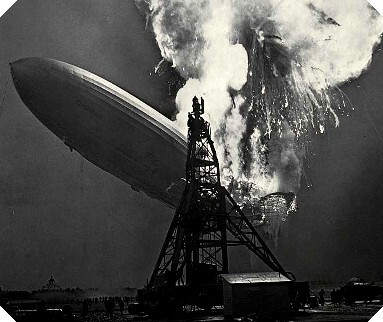 The most often sited reasons for the dirigible explosion are structural failure, St. Elmo’s Fire, static electricity, or sabotage. You don’t need a conspiracy theorist to tell you that “luridness” or “gauge” and “ill advised for an adult” as the reasons why this sweater went down like a lead balloon. Sorry to hear about sweater-crash, but so glad to see a post from you! Knitting A Mile Square is powered by	WordPress 5.1.1 and delivered to you in 0.231 seconds using 40 queries.